Veena Nagda got her big break when she was called to apply mehendi at one of Ambani's engagement parties. She made herself so indispensable that Karan Johar termed her as Bollywood's Mehendi Queen. 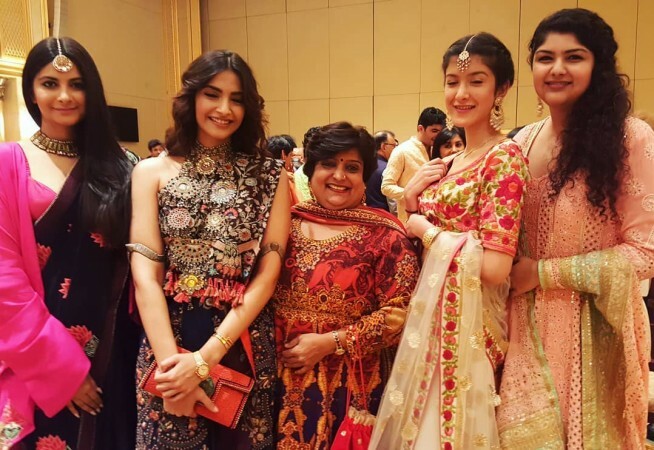 Sonam Kapoor's mehendi ceremony is on full swing and women from the Kapoor clan are getting their hands painted in mehendi designs. 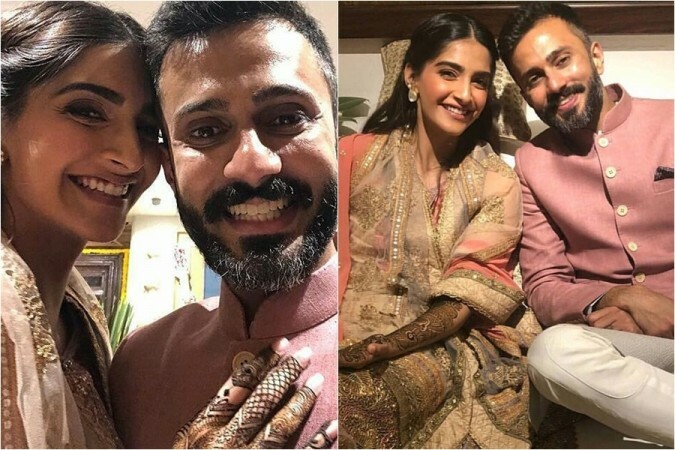 In one photograph on social media, Sonam is seen surrounded by four women, including Bollywood's 'henna queen' Veena Nagda, as they draw out customary designs on the Veere Di Wedding actress' hands and feet while the groom-to-be Delhi-based businessman Anand Ahuja looked suave in a salmon sherwani. But before Sonam and Anand' wedding on May 8, know who is Bollywood's 'henna queen' Veena Nagda. She is a well-known mehendi artist in the world of Bollywood. She has crafted mehendi designs which have been featured on popular Bollywood movies like Kabhi Khushi Kabhi Gham, Kal Ho Na Ho, Mere Yaar Ki Shaadi Hai, God Tussi Great Ho, U Me Aur Hum, Patiala House and Yeh Jawaani Hai Dewaani. She made herself so indispensable that Karan Johar termed her as Bollywood's Mehendi Queen. Born to a middle-class conservative Jain family, Nagda is the youngest of five sisters. Her mehendi drawing art started off with a hobby which later culminated into one of the most sought after careers. She began doing embroidery on saris after she was denied permission to pursue college by her family even after scoring a first class in the SSC. Her obsession with mehendi started when she took the mehendi cone in her hands as a teenager. She now specializes in bridal, nail polish, shaded, hira-moti, jardoshi, arabic, black mehendi, stone/ sequence/ swarovski diamond mehendi. She has traveled all over India including Delhi, Jaipur, Udaipur, Kolkata, Gujarat, Hydrabad, Pune and other big cities especially for applying Mehendi. Her big break happened when she was called to apply mehendi at one of Ambani's engagement parties and she started getting big offers. She is known for drawing intricate mehendi designs and has been a favourite among Bollywood brides including Sridevi, Jaya Bachchan, Dimple Kapadia, Twinkle Khanna, Farah Khan, Karisma Kapoor, Sunita Anil Kapoor, Dia Mirza, Urmila Matondkar and many others. Apart from Bollywood, Nagda is also favourite among top corporate bosses, rich businessmen, diamond and textiles tycoons, prominent doctors, lawyers and socialites who invite her to get mehendi designs on various functions such as engagement, Mehendi rasam, wedding, birthdays, exhibitions or religious functions. She has a team of mehendi artists and teaches different styles of mehendi art at her studio in Masjid Bunder and Borivali in Mumbai. Sharing some insights about her, Nagda told Rediff in 2005, "Farah Khan, the daughter of Sanjay Khan, called me for her wedding. I had three other mehendis on that day though, so she asked me to begin at 7am. That was my entry into Bollywood. I was booked for Suzanne Khan's mehendi eight months in advance. Apart from weddings, I also do mehendi for festivals. I have also done it for movies like Kabhie Khushie Kabhi Ghum, Kal Ho Naa Ho, Hum Tum and Kabhie Alvida Na Kehna. I got all my popularity because of Hrithik's wedding. I don't charge for celebrity weddings. They pay me according to their wishes and it has always been more than expected. As for my normal charges, for the bride it starts from Rs 3,000 to Rs 7,000 rupees, and includes both hands and feet. For guests, it is Rs 50 to Rs 75 per hand. My husband is very supportive. We have late nights, which are not allowed in our community, but he has been very cooperative." Sonam Kapoor's mehendi ceremony will take place on Monday, May 7 at Sunteck, Signature Island in Bandra Kurla Complex in Mumbai from 4 pm onwards where the guests have been asked to follow a dress code - Indian festive shades of white. The lovebirds will tie the knot on May 8 according to Sikh traditions at the actress' aunt Kavita Singh's (Sonam's mother Sunita Kapoor's sister) heritage bungalow which is next to Shah Rukh Khan's mansion, Mannat in Bandstand. The wedding will be followed by lunch at Rockdale 226, Bandstand Bandra. The dress code will be traditional. The dance and musical party will take place in the evening at The Leela, Mumbai from 8 pm onwards. The dress code for the party is Indian or western formal.